Nothing beats getting together with friends and family in the summer and having a big old garden party! They provide us with the perfect excuse to catch up, soak up the sun, and get merry. However, hosting a party can be a stressful task if you don’t know the best way to go about kitting out your garden. Hopefully, after reading this blog, you’ll be able to host an unforgettable party which will keep friends and family wanting to come back for years to come! People expect to be fed at a garden party and they expect to be fed with barbecued food! If you choose not to have one, then prepare to be attacked by a violent mob of angry guests. Sure, you could put a buffet on, but you can have a buffet at any point during the year. Sun = barbecue! 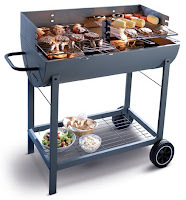 Here at Studio, we have a sizzling range of barbecues available, from smaller portable barbecues, to larger oil drum barbecues and stainless steel burners. The size of your garden and the number of expected guests should influence the type of barbecue you choose to purchase. As the sun goes down and the stars begin to appear, you’ll need some form of lighting to enable your guests to see. The last thing you want is a group of drunken people stumbling around in the dark! While solar lighting won’t illuminate your entire garden, it will create an ambient, relaxing effect that will help your party wind down in a peaceful fashion. 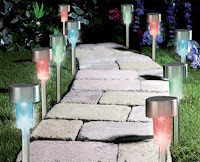 Solar lighting comes in various forms; colour-changing ‘stick’ solar lights can be used to illuminate paths and gazebos, while solar lampposts are great for illuminating a larger area. Many people choose to purchase solar lighting in the form of animal or Buddha statues and then place them among the flowers and bushes for extra decoration. It’s a fact; warm drinks destroy parties. Make sure you keep all your beverages cool and refreshing with one of our fun and practical inflatable beer coolers! Of course, you aren’t restricted to just putting beer in them, you can use them for any drink. Simply inflate and fill with ice, and you’re good to go! Our beer coolers are available in 4 styles; Man Utd, Chelsea, Liverpool and Arsenal. We all know that the British weather is the most unpredictable thing on the planet, so it never hurts to prepare yourself for a bit of rain with a gazebo. Not only do they keep your food, drink, tables and chairs safe from potential rain, but they also provide a great focal point for people to gather together in one place. At Studio, we have a wide range of gazebos available to suit a variety of budgets and preferences, from smaller pop-up gazebos, to larger, more substantial steel framed gazebos. We also stock barbecue gazebos to keep your barbecue covered, and wall-attaching gazebos to help you save space. Chimineas are versatile, free-standing fireplaces, which serve a variety of purposes. Not only do they make fantastic garden decorations with their traditionally rustic look, but they’re ideal for keeping guests warm when the temperature drops too. Simply fill the base with wood and paper, light it, and watch everybody gather round like moths to a flame. Consider burning aromatic wood such as red cedar or apple wood for a nice, relaxing scent, or burn Pinon wood to repel insects. If you don’t have a good supply of wood available, then look to purchase a selection of firelogs, which provide a clean, instant fire with no smoke. Remember, you can use your chiminea to grill food too! Check out our full range of garden and outdoor equipment today and spread the cost of your shopping!